On their face, all three documents were prepared about the same time in one of many successive campaigns to restrict playing at Blackfriars. The approximate date of the three (including the hand-writing) may be inferred from the third document, addressed to “William Lord Bishop of London.” William Laud, the first bishop of London since 1505 with that forename, held the office from 1628 to 1633, followed by William Juxon, 1633 to 1646. The second petition carries the date of January 21, 1618, or, as modern historians reckon time, 1619. It is a ca. 1630 copy of an original now in the London Metropolitan Archives (Rembrancia, v. 28, 29 (COL/RMD/PA/01/005); Repertory 34, f. 38v (COL/CA/01/01/038). The second petition also supplies a date for the original of the first petition: November 1596. Only the lost original of the first petition was prepared during William Shakespeare’s lifetime. The ca. 1630 copy shown here includes the neighbors’ petition and the list of signatories. 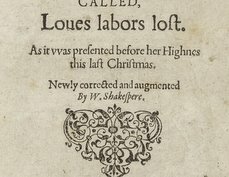 Shakespeare is not named, but by 1596 was in the same company of players as “one Burbage,” probably James Burbage, who had built the Theatre in 1576. The petitioners claim that Burbage “meaneth very shortly to convert and turne the same [rooms in Blackfriars] into a Comon playhouse.” Clearly, the Privy Council took the side of the petitioners. Not until a dozen years later, in 1608 and 1609, would James’s son Richard Burbage and his company successfully use the Blackfriars site as a playhouse. The petitioners submit a colorful, albeit one-sided, account of the playhouse environment. Having a playhouse in their midst would inconvenience neighbors in two ways: first, “by reason of the great resort and gathering togeather of all manner of vagrant and lewde persons"; second, “the same Playhouse is so neere the Church that the noyse of the Drummes and Trumpetts will greatly disturbe and hinder both the Ministers and the Parishioners in tyme of devine service and Sermones.” Other playhouses had been banished to the outskirts of the historical city of London; Burbage’s attempt to set up playhouses in “Liberties,” like Blackfriars, was regarded by the petitioners as a scheme to evade London’s jurisdiction over plays. The names of at least two of the petitioners in the list of signatories come as a surprise. “GHunsdon,” or George Carey, Baron (or Lord) Hunsdon, had evidently inherited the patronage of Burbage’s company on the death of his father Henry, July 23, 1596. 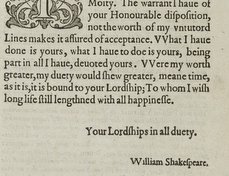 Richard Field, William Shakespeare’s countryman and presumed friend, had printed Venus and Adonis in 1593 and Lucrece in 1594. The position of “Elizabeth Russell Dowager” at the top of the list reflects her social standing; the self-styled countess is appropriately followed by “GHunsdon,” a baron. The specific complaint against “noyse” which “will greatly disturbe and hinder both the Ministers and the Parishioners in tyme of devine service and Sermones” suggests that the instigator of the petition was the Puritan minister of St. Ann Blackfriars, Stephen Egerton, whose name appears further down the list. Egerton was a known disparager of plays. In his sermon An Ordinarie Lecture, on false prophets, published in 1589 (sig. A6v), he complains: “They had as leaue heare such a one as see a playe, for the one dooth come no nearer the heart then the other.” In The Boaring of the Eare, a treatise published posthumously in 1623 (p. 54), he remarks: “let hearers consider how easily without irkesomnesse they can be present at a play, or at some other prophane and idle exercise and discourse of greater length then those Sermons which they doe so much distaste in respect of the tediousness (as they esteeme it) of them ...” If Egerton’s signature may reflect an opposition to plays in their own right, other signatures, like those of Burbage’s patron Hunsdon and Shakespeare’s countryman Richard Field, more likely reflect neighbors’ concerns about how a playhouse in the area would affect day to day lives. 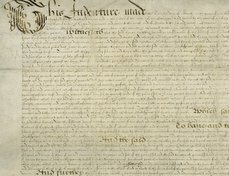 Some scholars regard the November 1596 petition as both an obstacle to the company’s fervent desire to move from an outdoor to an indoor venue, and an existential threat to Shakespeare’s career. Because the lease on the site of the Theatre in Shoreditch was to expire in 1597, by 1596 – so the theory goes – the Burbages staked all their financial resources on Blackfriars. Blocked by this petition, they were driven against their will to the Bankside in Southwark, where they established the Globe. 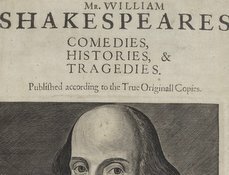 Near bankruptcy, the Burbages were forced to share their lease on the Globe site, signed on February 21, 1599 , with five senior members of their playing company, including William Shakespeare. Had this make-shift playhouse not succeeded, the playwright’s career might have ended in 1596. The Burbages had survived worse threats, however, including an uncooperative landlord and many bouts of the plague. When the company eventually moved into the indoor Blackfriars site in 1609, they did not abandon their outdoor Globe; and when the Globe burned to the ground in 1613, they rebuilt it at great cost. Shakespeare cannot have regretted the move to Southbank over the long haul, or the move to Blackfriars in 1609. The indoor playhouse probably encouraged the enhanced theatricalism of his very late plays, above all The Tempest. Stephen Egerton, An Ordinarie Lecture (1589). Stephen Egerton, The Boaring of the Eare (1623). Glynne Wickham, Herbert Berry, and William Ingram, eds., English Professional Theatre 1530-1660 (Cambridge University Press, 2000), 507-8, 522-5. Chris Laoutaris, Shakespeare and the Countess: The Battle that Gave Birth to the Globe (London: Fig Tree, 2014).